The TDE rapper dropped in on TMZ this afternoon to explain. It was all too good to be true after all. The blurred out Crying Jordan image that ScHoolboy Q shared on Twitter earlier this week with release news of his much-anticpated sophomore album Blank Face is not in fact the project's official album cover. On Thursday, the TDE rapper made an appearance on TMZ Live to explain that it was just part of an album announcement gone awry. "The fact that people think that i would use that as my album cover is funny," he said. 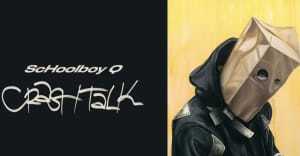 "Soon as I put it on my Twitter, everybody just said, 'ScHoolboy Q's album cover! ScHoolboy Q's artwork!' but they defeated the purpose of what I'm doing. I have a concept." The concept, allegedly, was to quickly release a series of images featuring the internet's faves, in the vein of the Crying Jordan image and the Trump image he shared last night. But when news sites, The FADER included, picked it up, his plan was halted. "It was only out for two minutes," he lamented. "They didn't even give me a chance." Afterwards, he shared a quick glance of his cell phone of what he referred to as being actual album art. Shortly after his TMZ appearance, he tweeted the image he shared with the caption "OFFICIAL." A representative for ScHoolboy Q confirmed that the project is titled Blank Face and scheduled for release on July 8, but could not confirm that the cover Q shared today on TMZ will be the cover. He had no additional comment.